Forum Iulii most likely owes its name and foundation to Julius Caesar. It is situated on a terrace overlooking the River Natisone where this stream exits from its Alpine valley and enters the Po-Venetian Plain. It subsequently crosses Aquileia before emptying into the Adriatic Sea. 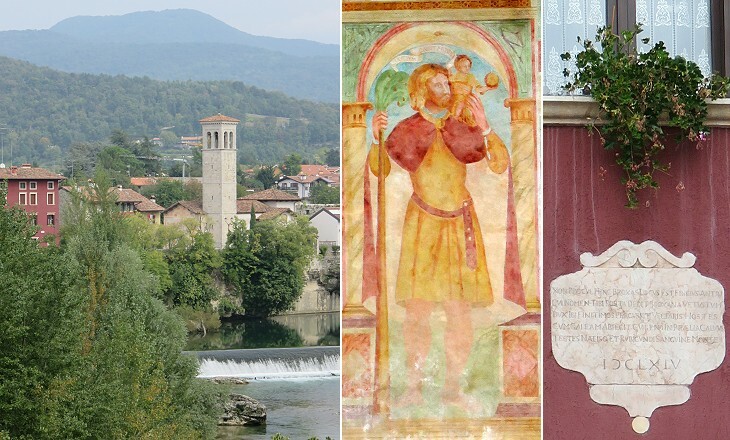 During the Middle Ages Forum Iulii became known as Civitas Forumiuliana and eventually as Cividale del Friuli. The name Friuli was (and still is) used to indicate the whole region at the north-eastern end of Italy. The choice of the site where Forum Iulii was founded was mainly due to its being naturally protected by a high cliff and by the river as a sort of wall and moat. A rock in the middle of the river bed was most likely already utilized by the Romans to support a timber bridge. A stone bridge was built in the XVIth century, but it was mined intentionally and blown up in 1917 and rebuilt in the following year. It owes its name to the tradition that its construction was made possible by the Devil in return of the soul of the first living creature crossing it. 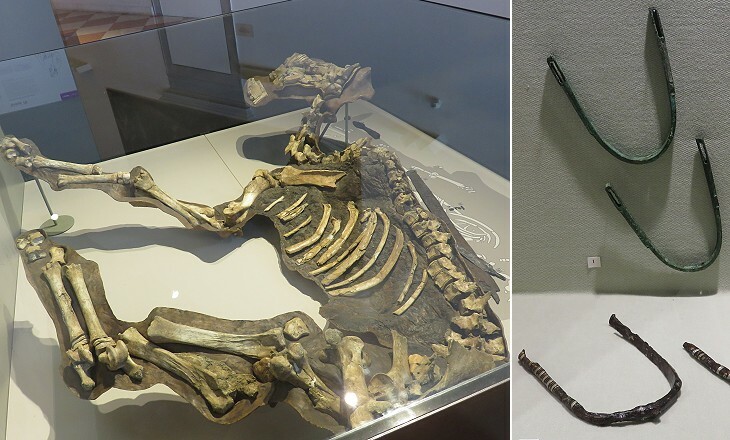 The inhabitants of Cividale used a dog to inaugurate the bridge and the Devil had to content himself with its soul. The monuments of the Roman period have vanished, most likely they collapsed in 610 when the town was sacked and set fire to by the Avars. 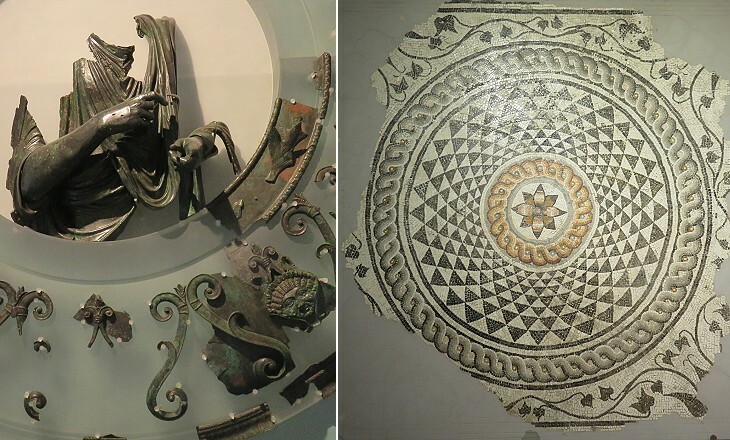 An elegant Roman mosaic found in the courtyard of a house at Cividale indicates that the town enjoyed some prosperity from its being the first one ancient travellers encountered after having crossed the Alps. In 568 the Longobards crossed the Alps and invaded Italy. The country was divided into two parts: the inland territories were conquered by the invaders whereas those along the coast remained under Byzantine rule. While other previous invaders such as the Visigoths, the Vandals and the Ostrogoths were not unfamiliar with the institutions and way of living of the Romans, the Longobards maintained their customs for a long time and a strongly military approach to ruling the territories they had conquered. Their leaders were buried with their horses, their parade weapons (as those shown in the icon for this section) and whatever they believed was needed to continue to fight in the afterlife. 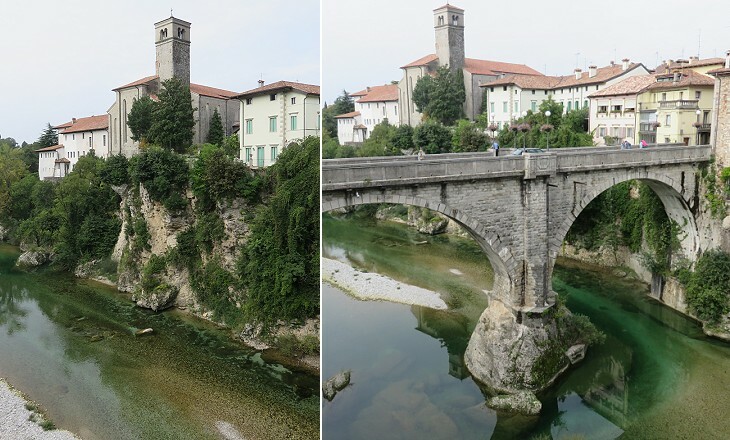 The Longobards made Cividale the centre of an important duchy and properly garrisoned it. The move of Germanic/Gothic peoples into the former Western Roman Empire left the territories they came from empty. Avars and after them Slav tribes settled in today's Hungary and on the Eastern Alps. SS. Pietro e Biagio is a small church outside the medieval walls of Cividale which stands on the site where an attempt by the Sclaveni (Slavs) to conquer the town was repelled. When taken prisoners the Sclaveni were treated as slaves (Medieval Latin: sclavus, the Romans used servus to indicate a person without freedom/civil rights). The rich have always had difficulties in accepting they would die in the same way as their servants. So they usually decided to be buried with signs of their status. When the Longobards invaded Italy this practice did not exist any longer because the rich had been convinced that by making donations to churches they would have obtained in the afterlife that special treatment they were entitled to (Lay not up for yourselves treasures upon earth, where moth and rust doth corrupt, and where thieves break through and steal. Matthew 19 - King James Version). The Longobards continued to be buried with all their gold and silver for at least a century after they invaded the country. Because of this the jewels found in their tombs are the main contribution they made to the works of art of Italy. 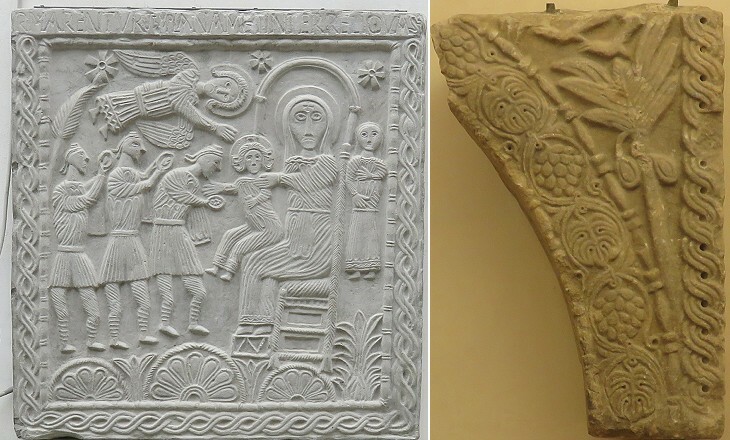 There are sculptured slabs, altar frontals, and "plutei," at Cividale, in which the ornament is excellent, even beautiful, but the attempts at figures of men and animals are beneath criticism. These poor artificers who, notwithstanding the imperfections of their chisel, often knew how to work in ornaments with sufficient grace, but in representing animals fell into an abyss of unskilfulness, must have avoided, one would think, like the pest, any occasions for representing the human figure, which, more than that of animals, requires solid artistic culture and a free hand; yet they did not, since we see in Cividale itself an altar of their making, covered on three sides by figures of sacred subjects. The inscription that encircles it says that it was ordered by King Ratchis (744-749), the son of Pemone, Duke of Friuli. The reader may imagine what sort of thing could issue from such hands. If the coarseness of the times did not justify the presence of these wretched things, one would think they were gross caricatures; they are such horrors that they can only be compared to those that the uneducated children of the populace often trace upon the walls of our houses, especially if newly painted and whitewashed. 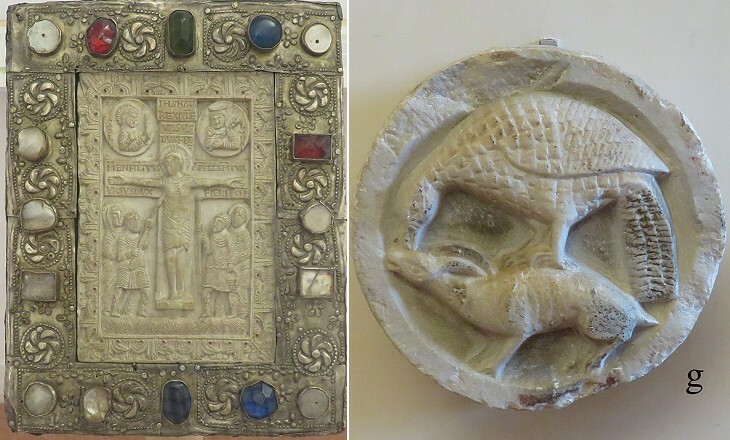 Truly, if all the sacred images that the eighth century offered to the veneration of the faithful had been of this stand, one would almost find even the fury of the iconoclasts reasonable. 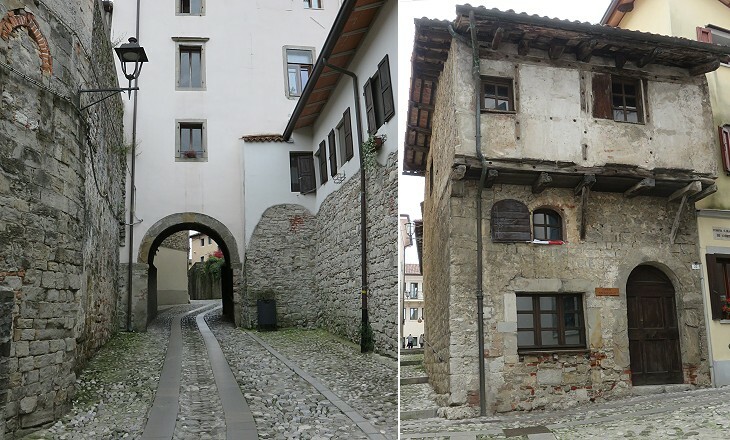 Where the most numerous and best preserved, if not the best, works of the Longobard style are to be found, in Italy is at Cividale, in Friuli. 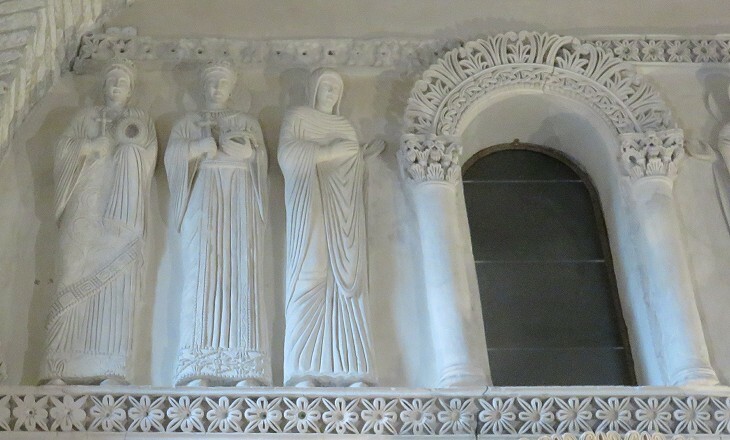 In face of the infantile and barbarous figures of the altar of Ratchis, how can we attribute to the same epoch, in the same city, these six statues which, though somewhat too long and wooden, and leaving something to be desired in the drapery, are nevertheless as superior to the others as the sun is to the moon? That elegant archivolt of proportions so just, and of an effect so lovely, so enchanting that any artist might be proud of having imagined it, is it not the most beautiful thing of the kind that exists in the world? The building is believed to have served as private chapel to the Longobard Dukes of Cividale before having been incorporated into the nunnery of S. Maria in Valle. Today there is a general consensus among art historians on dating Tempietto Longobardo to the VIIIth century. In 2011, with other Longobard monuments in Italy, it was inscribed by UNESCO in their World Heritage List (external link - it opens in a separate page) because its sumptuous decorative scheme (..) make this one of the most splendid and ambitious works to reach us today from 8th-century Europe. In 776 Charlemagne defeated the last Longobard Duke of Cividale and assigned the Dukedom to one of his sons. 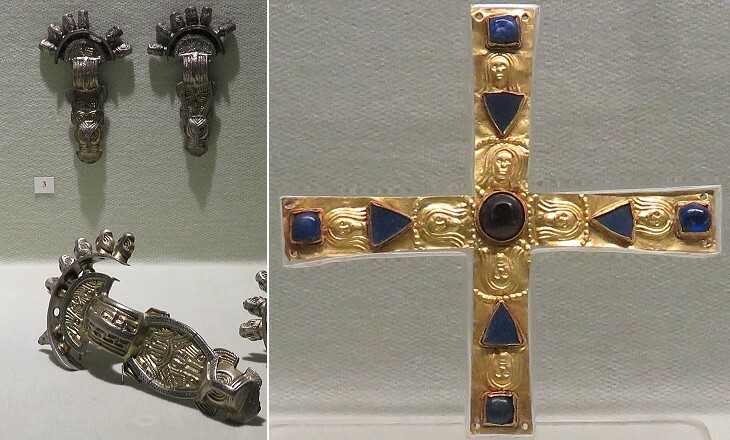 In the IXth century the Dukedom acquired the status of March and it included Istria and territories beyond the Alps which were inhabited by Slav tribes. A trade of Slav slaves flourished between the March of Friuli and the Republic of Venice which sold them to Egypt and other Muslim-held countries. In the late IXth century the Carolingian Empire began to decline and it eventually split into a number of states. 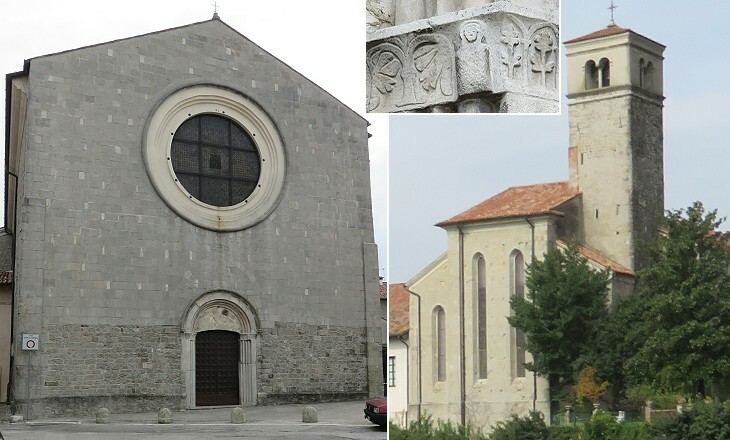 The Patriarchs of Aquileia (who had resided at Cividale since the early VIIIth century) acquired a power which was not limited to their direct possessions. In 1024 Patriarch Poppo conquered Grado, a rival Patriarchate, and in 1077 Patriarch Sigeard of Belstein was formally appointed Duke of Friuli, by German Emperor Henry IV. In the continuous controversy between the Popes and the German Emperors, the Patriarchs sided with the latter. They very often were noblemen of German origin. Relations with the Republic of Venice often turned into open confrontation, because the territories of the Patriarchate included Trieste, a port on the Adriatic Sea, which Venice regarded as a potential threat to its trade monopolies. 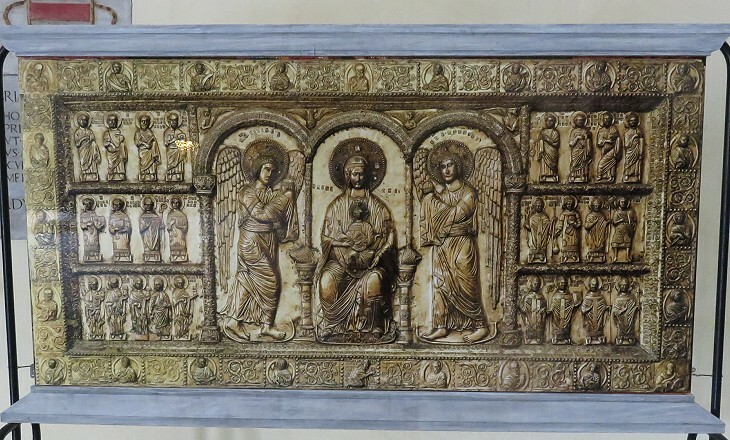 The silver altarpiece Patriarch Pellegrino II donated to the Cathedral of Cividale was most likely made in Venice, but the matter is still debated. In 1222 an earthquake struck Cividale and Patriarch Berthold of Andechs decided to temporarily move to Udine, a small town some twenty miles south-west of Cividale. The new location suited the Patriarch who promoted the development of Udine which eventually became the permanent see of the Patriarchate, thus causing the decline of Cividale. 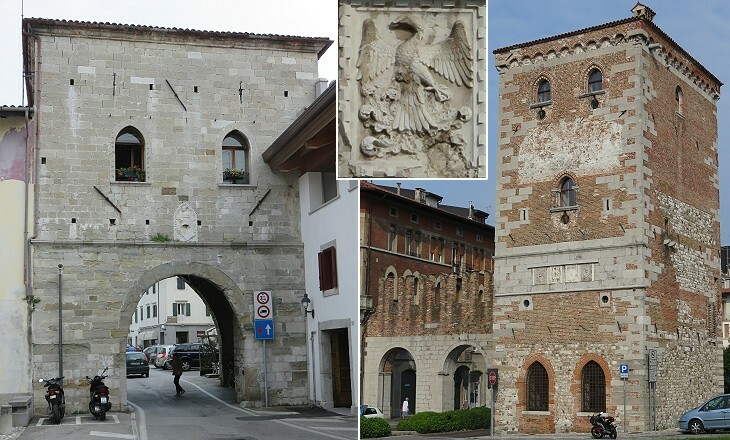 Cividale remained a possession of the Patriarchate of Aquileia until 1419 when its inhabitants opened the gates of their town to the Venetians. The monuments built in the following centuries are covered in a separate page. 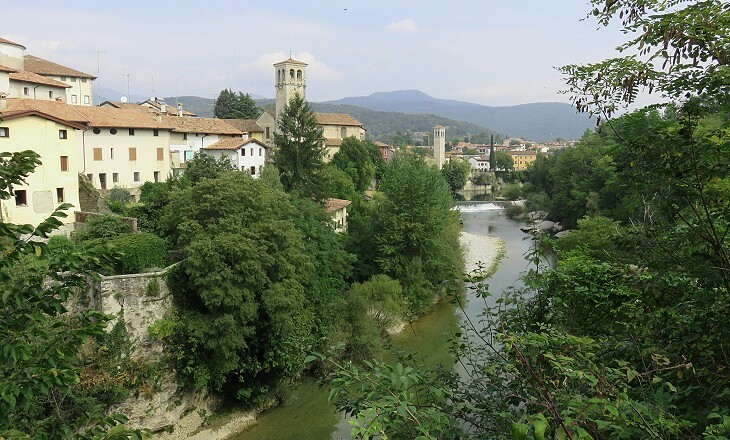 Today's aspect of Cividale is heavily influenced by the changes which occurred during Venetian rule and by some modernizations of the XIXth century, but the northern neighbourhood near SS. 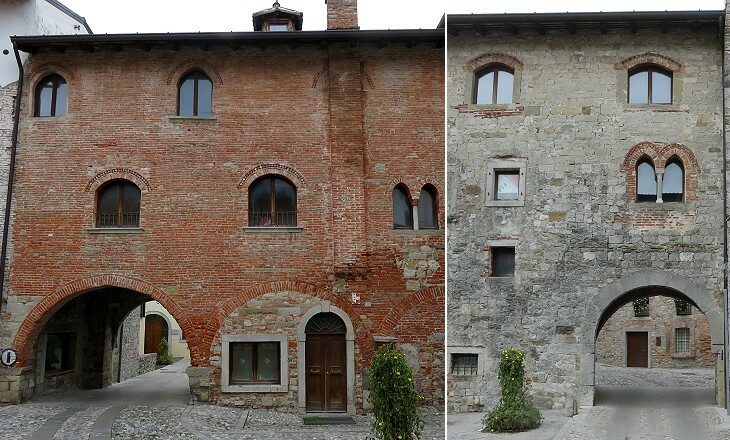 Pietro e Biagio and Porta Brossana retains many medieval buildings. One of them recalls Ottoman houses at Safranbolu, because it was built with stones (below) and timber (above) and the upper floor projects from the lower one.